A fifth-grade student walks into their first-ever puberty education class. They look around the room: maybe they feel like everyone else has already developed in ways they haven’t. Maybe they wonder why they already have characteristics a person of their gender isn’t “supposed” to have for a few more years. Or maybe they feel like they just can’t identify with lessons that should be giving them vital information about puberty and health. Indeed, most puberty education classes omit foundational issues about gender, leaving many students wondering about their bodies, their identities, and their health. Moreover, it has been challenging for puberty and health educators to find comprehensive, up-to-date information about gender that they can use to create gender-inclusive classrooms. Fortunately, that’s about to change. 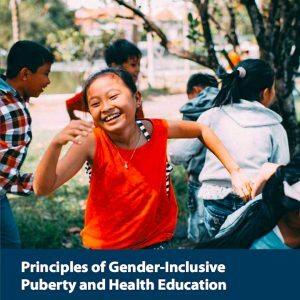 The new “Principles of Gender-Inclusive Puberty and Health Education” released by Gender Spectrum outlines a comprehensive guide for gender-inclusive puberty and health education. Without changing their current curricula, health educators can adopt these principles and begin to create more welcoming, supportive classrooms for all students. When applied to existing course materials, the principles convey language and practices that ensure that no student’s passage through puberty is stigmatized or made invisible. While some aspects of this journey are more common and some less, the guide seeks to reinforce the notion that the road through adolescence unfolds in an amazing variety of ways. The Gender Spectrum “Principles” guide is the first publication to address this call specifically related to gender. These principles emphasize that all youth are affected by the ways that puberty and health education approaches gender, and they apply to all students. The need for gender-inclusive puberty education is clear. Understandings of gender are evolving rapidly, and today’s youth are part of a generation that views the complexity of gender as a fact of life. In a recent survey, fifty-six percent of 13-to-20-year-olds said that they know someone who uses gender-neutral pronouns such as “they,” and 74% said they are more accepting of people with “non-traditional” gender identities than they were a year ago. Elementary and middle school students themselves are immersed in a world of gender diversity through their own families, popular culture, social media, and their peers. Gender-inclusive puberty education benefits all youth because it recognizes and affirms all students. Students who see themselves reflected in health curricula are more likely to succeed in school academically. Not surprisingly, gender inclusion practices and others designed to counter gender stereotyping have the capacity to improve the overall school climate. All young people have a right to accurate information to make healthy, informed decisions about their bodies and their relationships. Beyond their own unique development, this includes age-appropriate ways of understanding the diversity of human experiences they will encounter as adults. Without access to gender-inclusive puberty education, many students are left to believe that they are alone as they struggle to make sense of rapidly changing bodies and feelings. Nowhere is this potential for feeling alone and invisible more prevalent than among transgender and other gender-expansive students. These feelings, along with the stress borne of all-too-common stigmatization and discrimination, have been associated with alarming outcomes related to health and well-being, including disproportionately high rates of suicide, suicidal ideation, depression, disordered eating, sexual risk-taking, and drug and alcohol use. Educators will find valuable information and tools in the Gender Spectrum guide; parents and young people will find the principles useful in their family conversations and as a means of starting the conversation about gender-inclusion in their schools’ puberty education classes. The document “Principles of Gender-Inclusive Puberty and Health Education” and more information is available on the Gender Spectrum website. This guest blog was written by the staff of Gender Spectrum. Read about the pros and cons of teaching puberty education as a coed class.